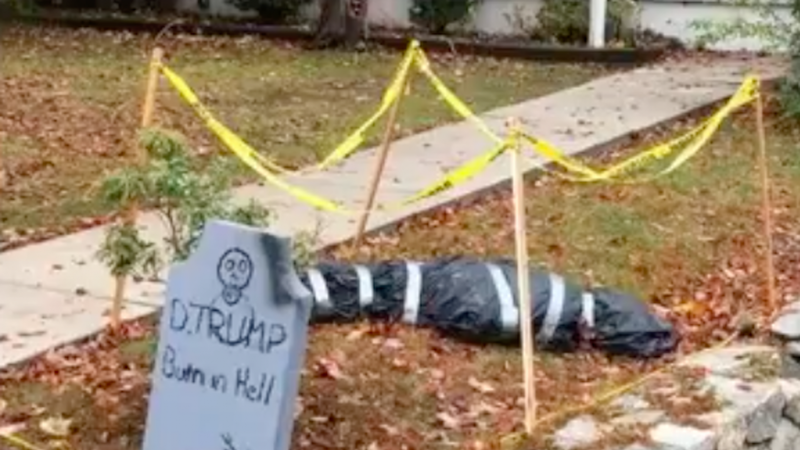 Tacky Halloween decorations can be found in neighborhoods throughout America in October, but not all of them cause as much conflict as Fabian Vergara’s Donald Trump tombstone has. Vergara has a tombstone set up in his yard that reads “D. Trump Burn in Hell.” It made one of his neighbors so upset that Vergara said she told him to go back to his country (he’s from Ecuador). “Fabian needs to be removed from the neighborhood,” said the neighbor, Theresa Gucciardo-Perry. Gucciardo-Perry approached Vergara after seeing the decoration to voice her displeasure, and Vergara said he initially planned to take it down, but changed his mind when she told him to leave the neighborhood. Gucciardo-Perry isn’t buying that story, however, saying she doesn’t believe he ever intended to take it down. An initial report from News 12 Westchester said Vergara was initially apologetic, but the conversation escalated into a political argument. Gucciardo-Perry said she had welcomed Vergara to the neighborhood when he moved in less than a year ago, but after this stunt she no longer speaks so warmly of her neighbor. Vergara maintains that the decoration is a harmless joke. Gucciardo-Perry said she believes the decoration is inappropriate for children to see, and said it tarnishes her efforts to teach her sons good values. Gucciardo-Perry is a Trump supporter, and also the widow of White Plains police Detective Michael Perry, who died of a heart attack in 2010. “I fight for what I believe,” Gucciardo-Perry said.